Category: Headwall Photonics. Tag: NANO - HYPERSPEC®. Today’s UAVs are exceptionally small and light and demand high performance payloads to match. Headwall’s Nano-Hyperspec® is a completely integrated hyperspectral sensor designed for the VNIR (400-1000nm) spectral range. Nano-Hyperspec includes an integrated data acquisition and storage subsystem of 480 GB and direct-attach capabilities for optional GPS/IMU. This allows the payload bay of the UAV to be optimized for extended flight times and endurance. Weight and size are minimized, making Nano-Hyperspec the industry’s most efficient airborne sensor solution. A supplemental airborne package is available that contains an advanced GPS/IMU and Headwall’s Hyperspec® III software. 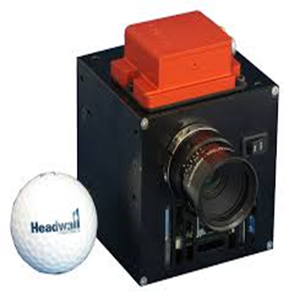 Headwall’s hyperspectral sensors use a concentric imager design that features aberration correction technology. Outstanding spatial and spectral resolution, a wide field of view, and high SNR are benefits that set Headwall apart in the field of airborne hyperspectral imaging. By integrating storage within the sensor package, battery life and flight-swath efficiency are both maximized. Nano-Hyperspec has a Gig-E connection that permits quick and easy off-loading of hyperspectral data. As part of Headwall’s optional airborne package, synchronized GPS/IMU data collection allows for orthorectification during post-processing. LiDAR capabilities can also be added to any Nano-Hyperspec application package upon request. Cellular microscopy, cancer detection, pathogen detection, and plasma studies are all achieving breakthroughs through the use of hyperspectral and Raman imaging. Satellites and other airborne platforms represent excellent opportunities for remote sensing. Headwall’s sensors help perfect resource exploration and environmental monitoring. On the ground or in the air, Headwall’s precision-packed small and light hyperspectral sensors represent a valuable strategic and tactical asset for ISR deployment. Advanced machine vision systems are using hyperspectral imaging to bring in-line inspection of foods and consumer products to new levels of accuracy, speed, and quality.